As the start of construction nears on a new community center funded by a state investment of more than $1 million, members of the Carrollton neighborhood remain apprehensive about the organization chosen to operate it — despite repeated assurances from officials that this is the most effective use of the land and the money moving forward. Trinity Christian Community, a Hollygrove-based social-services ministry founded in 1967, is seeking bids this fall for the building in the 1700 block of Monroe Street that will serve as its new headquarters, and hopes to begin construction in January, officials have told neighbors in a series of recent meetings. 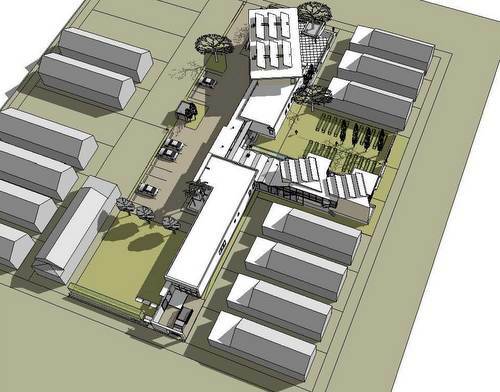 The $1.7 million project is based primarily on state funding for a community center planned for the property starting with the late state Rep. Alex Heaton and dating back years before Hurricane Katrina, officials have explained. The history of the funding for the project, how it ended up in the hands of a private, church-based organization, and what accountability Trinity Christian Community will have continues to be a concern for neighbors and members of the Carrollton Riverbend Neighborhood Association, however. State Rep. Walt Leger told members of the association at a special meeting on the issue in September that he is unsure how Trinity Christian Community was chosen five years ago to take over the project after the original concept was derailed by Hurricane Katrina, and when pressed by neighbors on the history of the original money trail, called it “certainly disappointing.” But what is clear now, Leger said, is that partnering with nonprofits is the only way new community centers are going to come into existence in the foreseeable future. The legislation that creates the funding for the community center requires it to offer five kinds of services to the community, according to documents obtained by Barry Brantley, the president of the Carrollton-Riverbend Neighborhood Association. It must have adult literacy classes, after-school tutorial and computer programs, job training and placement services, a senior center and nutrition site, and a community meeting area. Association member Betty DiMarco said the history of the project leaves the Carrollton community skeptical that the center will meet the neighborhood’s needs. A City Council meeting extending the zoning for the project in March, for example, led to a sharp exchange between Councilwoman Susan Guidry and some opponents of the project. Leger helped spearhead the creation of an advisory board for the community center, including five people: David Alvarez, Nicole Bouie, Rev. Calvin Franklin of Rising Star Missionary Baptist Church, Dr. Mary Green of Dillard University, and Andreas Hoffman of Green Light New Orleans. Trinity Christian Community director Kevin Brown promised to take the board’s opinions to heart. The organization drew accolades from several City Council members in the March meeting, and has been lauded for contributing to a reduction in crime in Hollygrove. Association member Jason Coleman, who has been a vocal opponent of Trinity’s control of the project, said he questions why an advisory board is needed. Why not simply add members of this community to the nonprofit’s actual governing board? he asked. Former association president Jerry Speir, however, said the actual people on the board are all known for being outspoken, and that he believes they will provide a measure of oversight. Members of the Carrollton Riverbend Neighborhood Association learned last week that one of the proposed members of the advisory board, Nicole Bouie, had decided not to serve. Bouie operates a program called Community Commitment that recently moved to 8540 Spruce Street, and has recently opened a coffee shop in the adjoining space at 1923 Leonidas called “Stella’s” to help defray the center’s $4,000 in monthly expenses. Neighbors have questioned whether the advisory board will have any real authority over Trinity Christian Community, but Bouie declined to discuss those issues in an interview late last week. She opted not to serve on it, she said, because she felt her energy would be better spent focused on Community Commitment. Even after the meetings with officials, some neighbors are still hoping the Carrollton-Riverbend Neighborhood Association will announce its opposition to the project based on those concerns, said member Drew Ward (a former City Council candidate). Any action like that, however, seems moot with construction so close to starting, he said. “I really don’t think there’s anything to formally oppose,” Ward said. A better course, DiMarco agreed, is to maintain vigilance that Trinity Christian Community is actually fulfilling the five requirements for the center laid out in the state legislation. Brantley, the association’s current president, said the key for moving Carrollton forward is to be clear about what the neighborhood needs, to which of those needs Trinity fills by its projected opening of December 2015, and to seek solutions to whatever needs still remain outstanding. Isn’t that a community center being built a few blocks away at Willow and Leonidas? What are the needs of the neighborhood that a community center will provide? Have they ever been expressed? How many community centers already exist in this area? Seems like a huge waste of public money IMHO. I’m no expert, but is there a first amendment problem with the government giving money to a religiously-affiliated organization to run a community center? If a church wants to do it all by itself and fund it all by itself, I see no problem with a religious group opening up its own community center, like other religious organizations have done (e.g., JCC). Would you feel ok if a Muslim group won PUBLIC money to run the organization? No matter if the organization were Muslim, Christian, or Jewish, or the Church of Scientology, I have the same problem – don’t mix government and public money with a religiously-affiliated group. Also, it is not an acceptable answer for a government representative to simply respond in effect “Duh, um, um, I don’t know how the organization was chosen.” That is passing the proverbial buck. An honest, hardworking, caring, fearless government representative would have the attitude, “The buck stops with me, and I’ll find out how the organization was chosen.” Not knowing how the christian organization got the green light should raise a red flag and de-legitimizes the entire project. To help avoid problems down the road, the process of selecting should be revisited. Now, any little hiccup with the community center will always be clouded by who was chosen and the inappropriate mystery of how they were chosen. Also, to reiterate, I think there may be a constitutional problem of selecting a religiously-affiliated group to build this community center using public funds. It is not necessarily unconstitutional, religious non-profits can administer government contracts and frequently do. Catholic Charities for example handles some immigrant services and they can do it without violating the Constitution by providing a service that does not impart religion. But this seems like a potential problem and a terrible waste of scarce state dollars. I know catholic charities regularly do so, but the fact that it occurs regularly does not make it constitutional. In fact, a federal court has held that the government violates the First Amendment’s establishment clause by providing money to catholic organizations to engage in immigration services. See http://www.freerepublic.com/focus/f-religion/2864610/posts. First Amendment questions are thorny, and most government officials don’t like to engage in the challenging analysis. With the type of back-room politicking that occurs in Louisiana, I bet you no one analyzed this First Amendment problem. This is an insane waste of money and valuable property. First, this render looks like a trailer. These community centers looked like blight before Katrina and I’m sure will return to that state shortly after being built. Sell that land off to build more homes and businesses that will actually employ people, not more centers to further enable unemployed people living in the neighborhood with nothing better to do. I’m sick of my tax money going to these useless nonprofits. If they actually did half they promised, there would be no poverty in New Orleans. What is New Orleans currently more in need of: functioning school buildings, or nebulously-defined “community centers?” There are more than a few schools that would be delighted to have a new, million dollar campus in that neighborhood. That “Process Chart” has a very big gap – HOW did the Cooperative Endeavor Agreement get assigned to Trinity Christian? 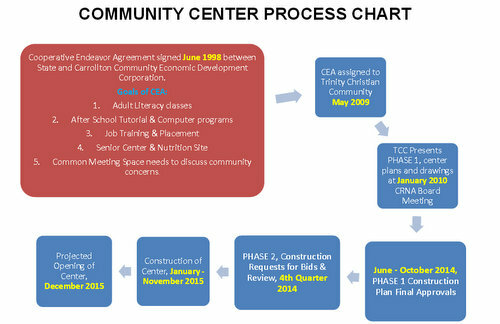 There are 10+ years and MANY details missing between the original Carrollton Community Economic Development Corp and TCC getting the project……what happened? Until there is transparency and real inclusiveness – this project will continue to tear our neighborhood apart – very sad.